Popular Broadway actor Gary Johnston is recruited by the elite counter-terrorism organization Team America World Police. As the world begins to crumble around him, he must battle with terrorists, celebrities and falling in love. BEFORE: After a great start to the day with class registration success I hope to follow that up with success in the movie marathon. The film that gets that opportunity is the film is South Park creators Trey Parker and Matt Stone’s Team America: World Police. I saw very brief bits in my AP US History class (because you know, America) and have heard many great things about it, but I’ll reserve my judgement until about an hour and a half from now when the end credits begin to roll. AFTER: At the beginning of the film I was very taken aback with the style and tone of the film. Based on my initial impressions, Team America: World Police was not looking very good. But then I watched more of the film and got accustomed to the style and satire the film is so big on. It transitioned from marionettes doing outrageous things to a surprisingly well shot film with a funny message. And I say surprisingly well shot because the cinematography was very clearly based on blockbuster films but I was able to appreciate it more in Team America: World Police. Most of the time the cinematography in big action hits is lost on me; my focus is drawn to the characters, the action, or the sets. But in Team America I found myself focusing on the images: the framing of the camera and the lighting. So while I had seen this visual style before I never thought about how common certain shots or lighting setups are and this film gave me a chance to see and analyze them. 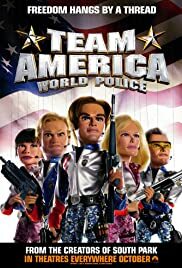 Besides cinematography, probably not the reason someone is going to watch Team America: World Police, the comedy is also a big attraction for the film. Again, it’s very outrageous and quite vulgar for most of the film. I think one of the reasons it wasn’t that appealing in the beginning is because I was taking it too literally and not realizing it was satire. Once I began viewing it from that perspective I understood the humor Parker and Stone were going for and the film became entertaining. Leading the way in the comedy department was actually the songs played throughout the movie (“The End of an Act” is my favorite) followed closely by the many impersonations of actors (Matt Damon and Michael Moore being my favorites among those). After a rocky start, Team America: World Police lived up to its high reputation. It definitely has a distinct sense of humor that you’ll probably either love or hate. Myself, I haven’t seen much of South Park but I can only assume that fans of the show will like Team America. If you don’t like South Park or are easily offended, you should probably steer clear of this film.